As a Lord, Beric Dondarrion certainly has important things to do back home. Sending a Lord on a mission like this one could be dangerous for the Lord's House and all the political consequences of ruining a noble House. As this question says, sending Loras would be a better idea, but we know Eddard is not a good politician. But why did he chose to send Beric Dondarrion? It looks like he was randomly in the crowd, with his friends (maybe thinking that after this boring session they will go to the tavern), and having no idea this decision will change his life. Beric isn't even a Northman... did they know each other? Is Ned Stark sure he can trust him? Did he have the occasion to confirm that Beric is a competent man? Why not send the official King's Justice, Ilyn Payne? According to the rules of the Kingdom, Eddard should have send Ilyn Payne, the King's Justice and Royal Executioner. But since Gregor Clegane is most likely working for Tywin Lannister and House Payne is a house from the Westerlands and sworn to House Lannister, he doesn't believe Ilyn Payne will chase Clegane. In truth, Ned did not trust the mute knight, though perhaps that was only because he misliked executioners. "I remind you, the Paynes are bannermen to House Lannister. I thought it best to choose men who owed Lord Tywin no fealty." 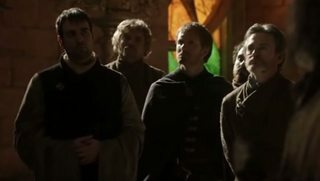 Lord Beric was in King's Landing to participate in the Hand's Tourney and stayed a few days after, hence was attending at the court. In the books, Eddard Stark doesn't ask him to assemble hundred men, but asks Beric Dondarrion, Thoros of Myr, Gladden Wylde and Lothar Mallery to gather each twenty men and adds twenty of his own men commanded by Alyn. Alyn is a trusted household guard of Eddard (not a knight but Ned doesn't care about knighthood). House Wylde is a House from the Stormlands, loyal to Robert Baratheon. House Mallery is a House from the Crownlands, loyal to Robert Baratheon. Thoros is a personal friend of the King Robert. As a fighter he served Robert against the Greyjoy rebellion. He also defeated Gregor Clegane several times in tourneys. Probably the most experienced fighter of them four. House Dondarrion is an old House, from the Stormlands loyal to Robert Baratheon. Seemed to be chosen over Loras Tyrell for his neutrality. "No one doubts your valor, Ser Loras, but we are about justice here, and what you seek is vengeance." He also takes the command of the whole group (instead of Thoros) because of his higher ranked titles. Is the fight in ‘The Mountain and the Viper’ realistic? Was the duel between Mountain and Viper against Tywin Lannister's plans? How was Myrcella's betrothed really chosen? Why was the necklace plot necessary? Why is Gregor “The Mountain” Clegane still a knight? Why did 'The Mountain' hesitate? Why didn't the Mountain step in front of Cersei? Why did Cersei say yes to the Mountain to kill Jaime?